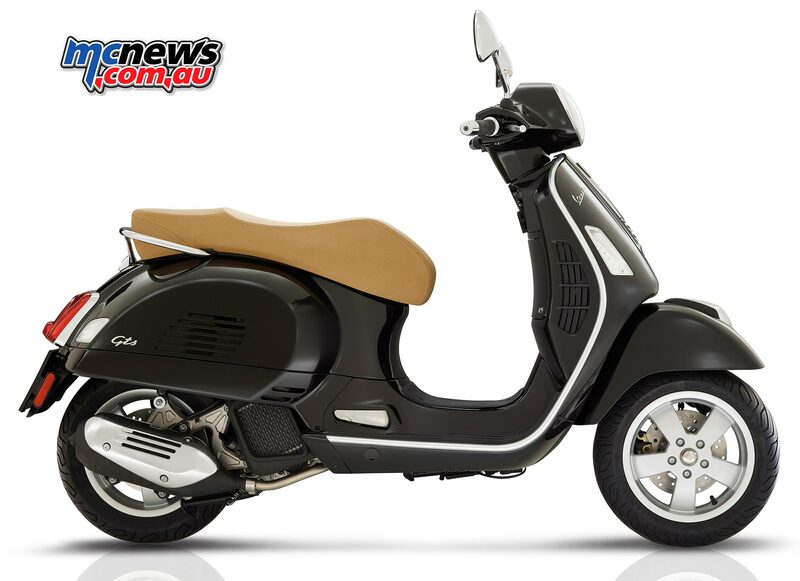 Retaining the iconic Vespa styling, the GTS 125 (pictured) and 150 are now powered by the latest generation i-Get powerplants. From the GS in 1955 to the PX in 1978, touching on the Vespa Rally in 1968, the largest Vespas have always combined excellent performance and comfort, even on the longest and most demanding routes. The 2017 Vespa GTS has been revamped with the adoption of the modern and technological i-Get powerplant in its most advanced version with liquid cooling, electronic injection, four-valve timing and, for the first time on a Vespa, the “Start and Stop” system. On the Vespa GTS the new family of i-Get engines arrives, available in 125 and 150cc displacements with electronic fuel injection, four-valve timing and liquid cooling. These are engines at the top of their respective categories in terms of performance and environmental friendliness. The new Piaggio patented Start & Stop system called RISS (Regulator Inverter Start & Stop System) makes its début on the Vespa. This system does away with the traditional starter motor, which is replaced by a brushless “direct mount” electrical unit, installed directly on the crankshaft. This provides several benefits, extremely quiet start-up, lighter weight and more reliability, less fuel consumption. The Piaggio Start & Stop automatically switches off the engine three to seven seconds after the vehicle stops (depending on whether or not the engine has reached the correct operating temperature). A slight twist of the throttle instantly restarts the engine, in complete silence, given the absence of the traditional starter motor. If the side stand is lowered or if the tilt sensor is activated, the ECU bypasses the Start & Stop function, in other words, the engine switches off and does not restart automatically. Each and every one of the components on the new engines, from the exhaust to the internal design of the gearbox cover, all the way to the air filter, has been designed to make the ride smoother, quieter and more comfortable, and to increase the life of the engine. A large portion of the Piaggio technical work had to do with the attention to reducing friction through the introduction of bearings on every rotating part, in the timing and in the crank gear geometry, with the cylinder axis shifted to reduce losses due to friction on the piston. The mechanical noise of the new i-Get engines is also extremely low thanks to a reduction in play and an optimisation of the materials and shapes. 2017 Vespa GTS 125. The heavily revised engine offers strong performance and reliability, as well as the RISS system, which turns the scooter off during periods of inactivity, and restarts the bike on throttle opening. The thermodynamics: head, cylinder, piston, rocker timing with rollers and all of the parts in motion have been optimised to reduce weight and operating friction. The eighth-litre version is credited with power of 9kW at 8250rpm, whereas the more powerful 150cc puts out 11kW at 8250rpm. These are numbers that translate into quick engines on the road, specifically designed and built bearing in mind the needs of the rider for daily use in city and metropolitan environments. These are riding conditions characterised by frequent starts and stops which require elasticity, quick acceleration and a smooth ride. 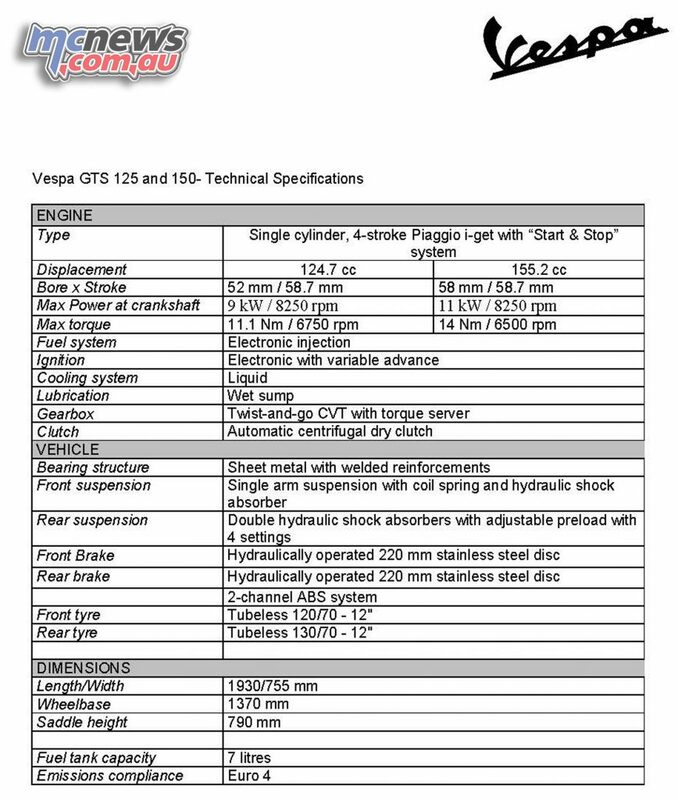 These characteristics are ensured by excellent torque (11.1 Nm at 6,750 rpm for the 125 cc and 14 Nm at 6,500 rpm for the 150 cc) which provide Vespa GTS with excellent acceleration both from a stop and in motion. The new engines also guarantee lengthy service and maintenance intervals. Fluids and filters are changed every 10,000km and valve clearance only needs to be adjusted every 20,000km. The 2017 Vespa GTS 125 and 150 both delivery over 40km per litre fuel economy. Overall fuel consumption benefits from the optimisation of each and every component, mileage on the WMTC cycle reaches 42.4 km/L for the Vespa GTS 125 (41.1 km/L for the GTS 150). 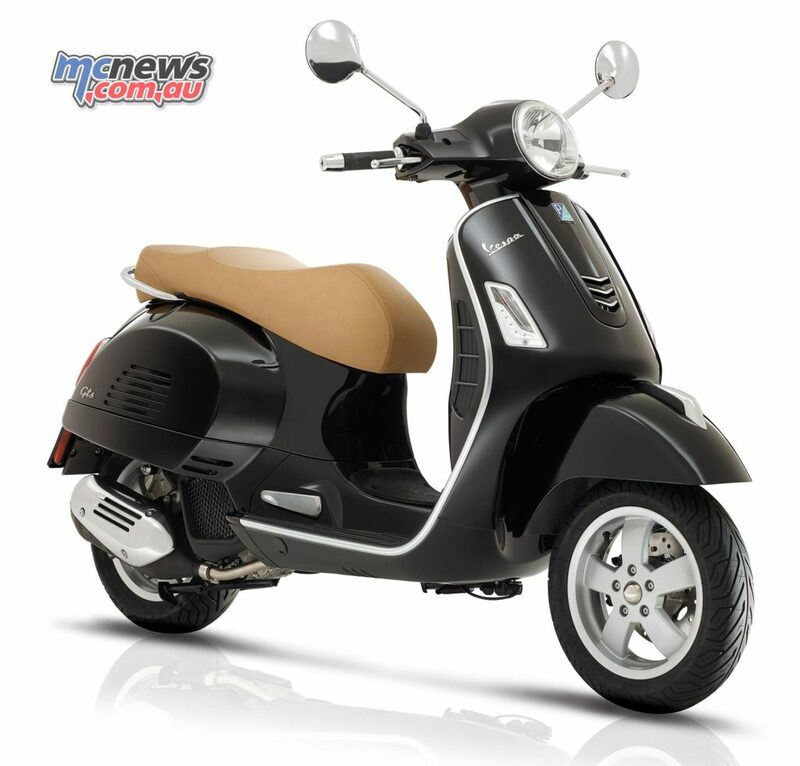 The Vespa GTS still maintains the distinctive traits that are so characteristic of the large body Vespa, but it also has numerous and important aesthetic updates. The Vespa GTS also have a “tie” on the front shield with a modern design, front and rear turn indicators characterised by new clear plastics and a rear light assembly elegantly adorned by a chromium frame which recalls the finish of the crest on the front mudguard. The footboard central tunnel cover is enhanced by the Vespa logo. 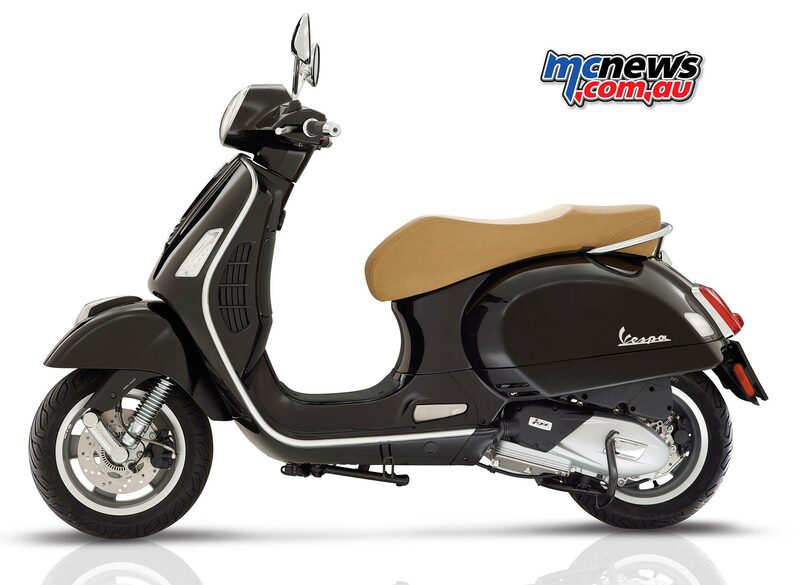 The saddle on the Vespa GTS provides superior comfort thanks to the specific padding and new covering. The helmet compartment fully exploits the available space and is able to hold two demi-jet Vespa helmets and more. To further increase the cargo capacity of the Vespa GTS, there is a compartment in the leg shield back plate, ideal for keeping smaller objects handy such as glasses, documents and mobile phones, as well as the convenient bag hook on the upper part of the leg shield back plate. On Vespa GTS, you can also count on the convenient and solid support of the rear luggage rack. Now standard on all models in the Vespa GTS range are the remote control to open the saddle and Bike Finder, extremely convenient for finding your Vespa in a crowded car park by making the turn indicators flash. The USB port is not missing, located in the leg shield back plate compartment, convenient for recharging any external device, while the front turn indicators contain a series of LEDs that act as daylight running lights. The trapezoid-shaped digital instrumentation is characterised by its compact size, but also by the extremely exhaustive information provided, it is made up of a classic speedometer and a small multi-functional digital area surrounded by six service indicator lights. The information provided includes the fuel level, time and two partial odometers. The 2017 Vespa GTS 125 and 150 both feature ABS. 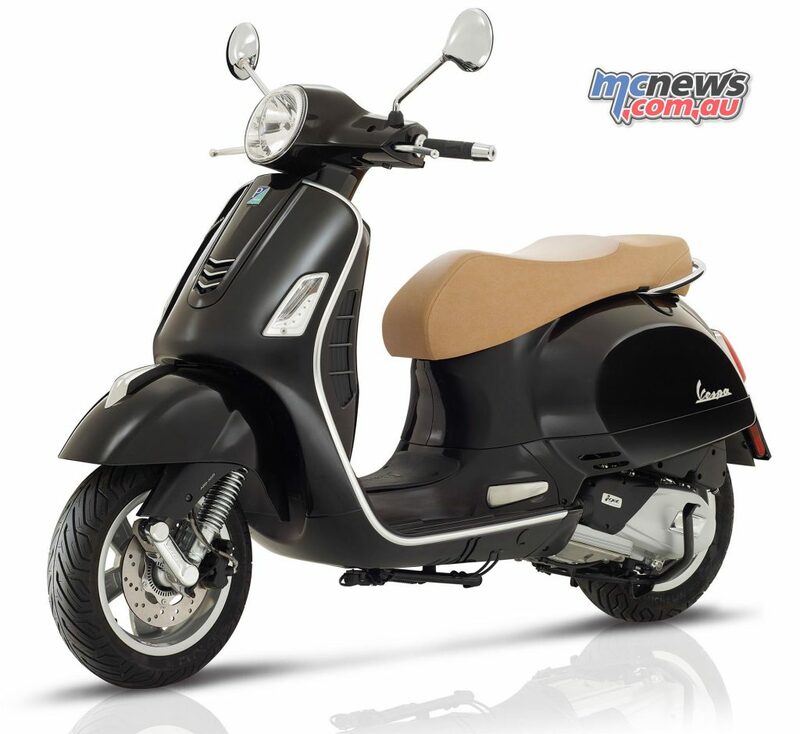 The new Vespa GTS 125/150 is naturally compatible with the Vespa Multimedia Platform (VMP). When a Smartphone with one of the most common operating systems is connected to the on board electronic system VMP transforms it into a real and sophisticated computer which is capable of providing the rider with various information both on the condition of the vehicle and on the route travelled. This allows the rider to use the Smartphone’s touchscreen to keep constant tabs on all riding parameters and to handle both city traffic and longer trips in complete safety. The Piaggio Group was the first company in the world to introduce electronic systems on scooters which were once available only on the best motorcycles, such as ASR (available on the GTS 300 version) and ABS, which also equip the GTS 125 and 150. Each wheel has a revolution detection system – a sensor and a tone wheel – which instantly reads the speed and deceleration of the wheel with respect to that of the vehicle. The sensors dialogue with a two-channel hydraulic control unit which activates the ABS system if one of the two wheels decelerates abruptly with respect to the vehicle, avoiding locking and ensuring stability and efficient braking even on road surfaces with a low friction coefficient. The new Vespa GTS/150 is conceived on the reliable, tried and true technical foundation of the previous series. The body, as has always been the case for Vespa from 1946 to the present, is made strictly in steel and provides incomparable sturdiness, in addition to safety features and truly unique dynamic performance. The result is a particularly brilliant ride both in city traffic and on country roads: a mix of thrilling handling and reassuring stability, partly to the credit of wide tyres mounted on 12 inch diameter rims. The dual disc braking system ensures ever-ready decelerating power even in sport use, with modularity that puts even beginners at ease. As always in Vespa tradition, the new GTS has a wide range of accessories so you can personalise your vehicle and increase comfort and functionality.